Update the look of any room in your home or increase your property’s real estate value with gorgeous tile flooring from our company. We carry a wide selection of tile floor products created with various materials that include porcelain, slate, and ceramic. Add refinement and elegance to your bathroom, kitchen, entryway, or virtually any other room with flooring from our tile collections, which is available in a wide range of colors and sizes. After choosing the perfect tile to suit your needs, budget, and personal taste, our tile flooring installation specialists are able to properly and safely install your new investment. This ensures that your floor is installed to be watertight and long-lasting. Our flooring experts are always happy to answer any questions and help you choose the floors that suit your aesthetic preferences and functional needs. For households with members suffering from allergies or asthma, tile is an excellent option for any room. Dust, dander, animal hair, and other allergenic materials do not cling to it so that the air quality in the rooms is cleaner and fresher. With regular sweeping and mopping, your tile floors are sure to help you breathe easier and stop sneezing. Why Is Tile Floor Suitable for Any Room? As a water-resistant, hypoallergenic, and extremely versatile material, a tile floor is suitable for any room in your house, including bathrooms, kitchens, hallways, and even living and bedrooms. With its versatile designs and low maintenance qualities, tile remains a widely popular and attractive option. 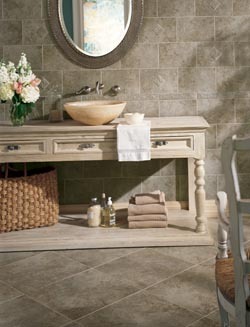 Due to its water resistance and durability, many people choose to install ceramic tile in their bathrooms and kitchens. Because these are rooms in which we frequently use plumbing, it’s important to use water-resistant flooring. A tile floor effectively shields the sub-floor from mold-causing moisture and spills. Unlike other types of flooring, tile offers increased durability. This means it lasts longer and resists cracking, chipping, and damage due to dropped objects or high amounts of foot traffic. It’s also able to resist extreme temperatures, making it perfect for outdoor areas like swimming pools, patios, and outdoor kitchens. Tile flooring can be tricky to install, so make sure you don’t leave it to an amateur. After discussing your options and choosing a tile that matches your taste and budget, get tile flooring installation by our team of skilled professionals. We make sure your beautiful new flooring is straight and level, properly sealed for maximum moisture resistance, and structurally sound. With proper installation by our knowledgeable experts, your new floors are sure to look and function great for many long years to come. Enjoy the elegance and durability of tile floors in any room of your house in addition to its convenience and hypoallergenic nature. For homeowners who don’t have much time to dedicate to cleaning, this flooring is an ideal option. It doesn’t require vacuuming or intensive steam cleaning and can be cleaned with simple sweeping and periodic mopping. Use a mild detergent on your tile floors and cleaning materials like rags or chamois mops rather than sponges, which can dull the glaze on your tiles or cause streaking. To avoid cloudy or dull tiles, be sure to sweep up any sand or grit as necessary. Tile flooring is dirt-resistant, but you should always remove any residue promptly. Be sure to use non-abrasive cleaning solutions and fabrics, and periodically clean the tile grout using simple solutions like baking soda and water. Contact us when you’re ready to choose your new tile flooring. We’re proud to serve clients in Kalamazoo, Michigan, as well as the surrounding areas.